PennsylvAsia: Decorative Sushi Workshop, October 13 in Cranberry. Decorative Sushi Workshop, October 13 in Cranberry. The Japan-America Society of Pennsylvania will present a Decorative Sushi Workshop on October 13. Kazari Maki-Zushi is a patterned or decorative sushi that is derived from several sushi techniques. Kazari Maki-Zushi can be anything – flowers, fruit, animals, words and even logos. No prior experience is necessary as it involves a different process than creating regular sushi. 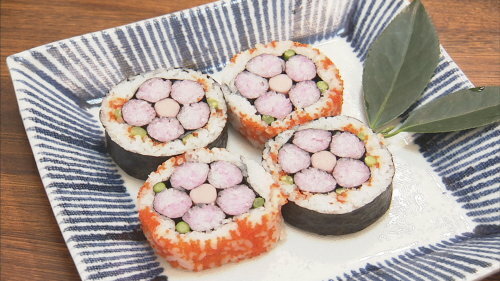 At this event, Fumiyo Iwadachi will demonstrate techniques to make decorative sushi. Participants will make their own peach blossom and square designs. Registration is $25 for JASP members and $35 for non-members. It will be held at House of Chen at 101 Brandt Dr. in Cranberry (map). Registration can be completed online.